The Allied failure in the disastrous Gallipoli campaign brought large numbers of imperial troops, including many Australians, back to Egypt, where they would in time be used for operations against the more remote parts of the Ottoman Empire. In January 1916, as the troops were landing back in Egypt, some were used to create four company-sized formations of infantry mounted on camels, the first Australian camel corps. Some British companies were added a couple of months later, and four more Australian companies were added in June of that year. At the end of the year these Australian companies and the others were combined to form the Imperial Camel Corps, which was now organised into three 770 man battalions, two of which were Australian. These units now also included sections of machine guns and mountain artillery amongst others, and served mostly in the Sinai and Palestine. They participated in many actions big and small, but as the imperial forces pushed into Palestine the advantages of the camel became largely redundant, and the Australian units were removed from their camels in June 1918 and used to form the 14th and 15th Light Horse regiments. As with the other Great War camel sets so far made by Strelets, this one consists of nine mounted poses plus a few dismounted men. Taking the mounted poses first, all of them are pretty good, with men holding a rifle and in apparently relaxed mood. As mounted infantry these men would always dismount to fight, so these relaxed poses make good sense and we thought all were appropriate, with the one query being why are they all holding their rifle when these would often have been stowed on the animal while in transit? Two of the poses make a nice little pairing which with hindsight we should have pictured together; the last man in the second row is passing a water bottle to the fourth man in the top row. The poses of the dismounted men include a man holding (or pulling?) a camel, which is reasonable as when in action one man in 12 or so was detailed to hold the camels toward the rear, although there is no animal in the set to pair with this man. The rest of the foot figures are headquarters staff, being a man using a field telephone, one using a heliograph and one using a telescope, quite possibly to observe the heliograph message. As ideas we really liked all of these, and by putting them in a cavalry set you get just one each per box, which will be plenty for most people. Apart from missing the telephone wire, which is easy to understand, the telephone operator is very good, and so too is the man with the heliograph, although this device is on a tripod with very little spread at the bottom, so is not at all realistic in that way. The telescope is also mounted on a narrow and unstable tripod, but also has the strange characteristic of being slung some way below the top of it, which seems hard to believe is accurate. The camels are exactly the same models as appear in several other Strelets camel sets, and we have discussed these less-than-ideal poses in our review of the British Camel Corps. Essentially the look of the animals is good, but the two walking poses have legs in the wrong place, and the second row of animals are a sort of hybrid between standing and walking, so look very odd. Only the bottom two animals are well posed. Most of the men in this set wear standard Australian uniform of tunic and trousers, although a few are in shirt sleeves, which must have been common enough too. Everyone wears the ubiquitous slouch hat, which here does not have one brim pinned up, which is correct as the men had the brim down all round to improve shade from the scorching sun. As infantry they correctly wear puttees rather than cavalry long boots, so the uniform is properly done. Such men wore a waist belt with pouches containing 50 rounds, plus a bandolier with 90 more. 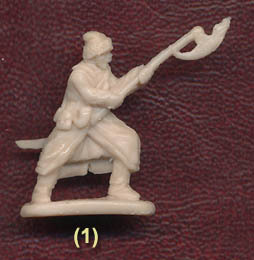 Strelets have done the waist belt correctly but unfortunately have only supplied their figures with the infantry 50-round bandolier, but several photos confirm this is wrong, and a hard thing to correct too. They also have water bottles and haversacks, and the officer has a pistol holster and case for his binoculars. The men hold the standard .303 inch Short Magazine Lee-Enfield rifle, apart from one that holds a Lewis gun, which like the rifle is not a weapon he would use whilst perched on a camel, so is a little strange. The detail on the weapons is pretty good, and the same goes for the sculpting over all. Proportions are pleasing and postures are natural and believable. We found attempting to place the man on the saddle and have the pegs fit the holes in the animal was quite a challenge and impossible in some cases, although where this can be done the effect is very good. There is a little flash in places here, and very occasionally much larger lumps of flash, but for the most part these are relatively clean figures that won’t need too much work. A large mistake made by Strelets on all their camel sets is they have given the men stirrups, a device of no use whatsoever and never issued as a result, so some removal of plastic required there. Also we would have liked to have seen a lot more kit around the saddle – the men often asked their camel to carry loads of 200kg or more, including 240 rounds of ammunition, 23 litres of water and a similar weight in feed, but there is little sign of that here. Two of the animals have holes at the back into which a couple of small bags can be inserted, but this hardly addresses the issue. Yet despite these misgivings about certain areas of accuracy, and the ill-judged camel poses, this remains an attractive set which offers some appropriate riders and some particularly interesting foot figures, all correctly dressed and armed. If something short of a triumph, this unusual and interesting set is still nicely done for the most part and brings a little of the exotic to a world war usually remembered as anything but.